Pamela M. Magnano practices in the area of family law, representing clients in divorces, legal separations, support issues and child custody matters in Connecticut and Massachusetts. Since 2003, Attorney Magnano has represented clients and children at all levels of family proceedings and has appeared in family courts throughout the state of Connecticut, including the Regional Family Trial Docket in Middletown. Prior to practicing law in Connecticut, she was one of four attorneys in a prominent law firm in Braintree, Massachusetts. There, she practiced in family law and represented clients in numerous courts throughout the state of Massachusetts, including family and probate court, civil court and criminal court. Attorney Magnano began her courtroom experience as a student prosecutor in law school, where she prosecuted all levels of crimes from arraignments to trials. 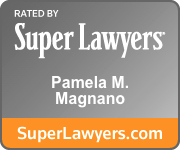 Super Lawyers™ selected Attorney Magnano for inclusion in Connecticut Super Lawyers in every year since 2014. Super Lawyers is a rating service of lawyers who have attained a high degree of peer recognition and professional achievement. The selection process is multi-phased and includes independent research, peer nominations and peer evaluations. Pam was also selected to Connecticut Rising Stars in 2010, 2011, 2012 and 2013. Super Lawyers Rising Stars is a list of talented, up-and-coming young lawyers. Martindale-Hubbell recognizes Pam with an AV Preeminent rating for ethical standards and legal ability. The Connecticut Law Tribune recognized Attorney Magnano in New Leaders in the Law 2013. Out of nearly 300 of the best and brightest nominees, Pam was one of 60 young attorneys to be recognized in the New Leaders in the Law 2013 yearbook published by the Law Tribune. Pamela M. Magnano graduated from Stetson University in Florida and then received her Juris Doctor degree at Suffolk University Law School in Boston, where she earned a place on the Dean’s List. Attorney Magnano is a member of the Connecticut Bar Association, the Massachusetts Bar Association, the Hartford County Bar Association and the American Bar Association. Attorney Magnano served as the Co-Chair for the Family Law Committee of the Young Lawyers Section of the Connecticut Bar Association from 2006 to 2009. In this position, Attorney Magnano co-chaired several seminars on family law topics. Each of these seminars featured some of Connecticut’s most prominent family law attorneys and most respected judges. Attorney Magnano also serves as a Special Master in the Tolland and Hartford Judicial Districts. To ensure that she is up-to-date on all of the recent developments in her practice area, Attorney Magnano attends several Continuing Legal Education Courses each year. In addition to keeping up with this training, Attorney Magnano has knowledge of all of the computer software needed to be efficient in the field of family law, including FinPlan Westlaw, and LexisNexis. Beginning in law school and continuing throughout her career, Attorney Magnano has been involved in several charitable events and organizations. While in law school, she volunteered with Shelter Legal Services, an organization located outside of Boston, Massachusetts, which provided legal representation to individuals in local shelters. Through this experience, Attorney Magnano was able to help battered women with housing issues, domestic violence issues and family law issues. Since becoming a member of the bar, Attorney Pamela M. Magnano has continued to give back to the community and was recently named to the Board of Directors for the Children’s Law Center of Connecticut.